The ZM5304 serial interface module takes the RF design effort out of Z-Wave. 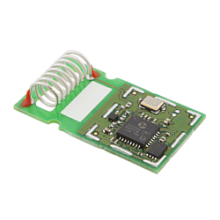 The ZM5304 is a fully self-contained module that includes a Z-Wave modem and built-in antenna. The module comes with full FCC modular approval and is pre-scanned for CE approval, making hardware integration and approval very simple. Designed for easy integration and fast time-to-market, it is ideal in for the following applications and markets.